Roses, tulips, gerbera, hydrangeas, for a truly personal expression of your love. Martin's delivers your Valentine flowers all around Toronto. Fresh, fragrant and romantic! Exclusive high-end designs at all price points - the Martin's Exclusive collection is sure to please! Make someone's special day extra-special with flowers delivered to their workplace or home. 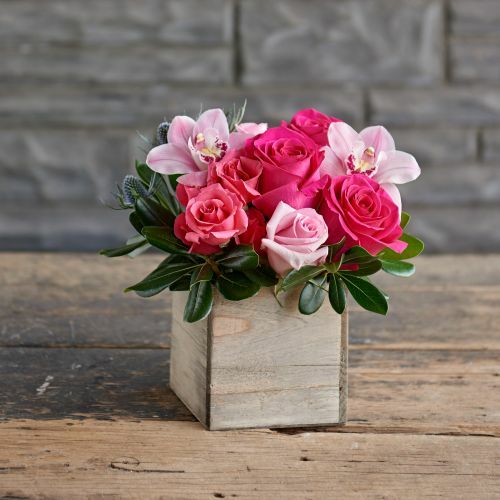 Gorgeous flower arrangements suitable for any occasion - or no occasion at all. Filled with shades of pink roses, cymbidium orchids and a touch of blue thistle. How much do you love this design?